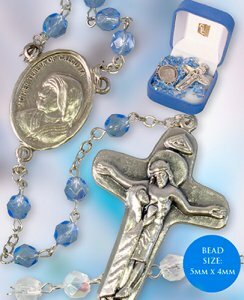 CATHOLIC GIFT SHOP LTD - Blue Glass St Teresa Rosary Beads (Mother Teresa). Blue Glass St Teresa Rosary Beads (Mother Teresa). Mother Teresa blue glass rosary beads boxed. Glass bead: 5 x 4 mm oval.